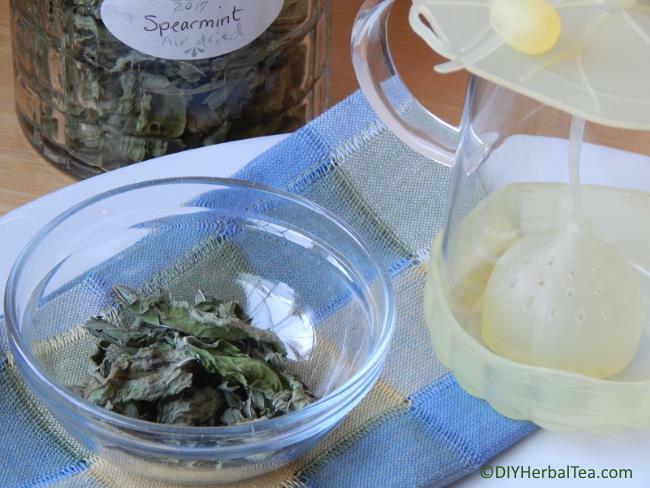 I'm so glad you've joined me in the fun and yummy world of growing your own herbal tea! Whenever I visit a website or blog for the first time, I'm curious about the person "behind the scenes". Just in case you're one of those curious types, too, here's a little bit about me and my website, DIY Herbal Tea. For as long as I can remember, I've loved diggin' in the dirt and growing things! 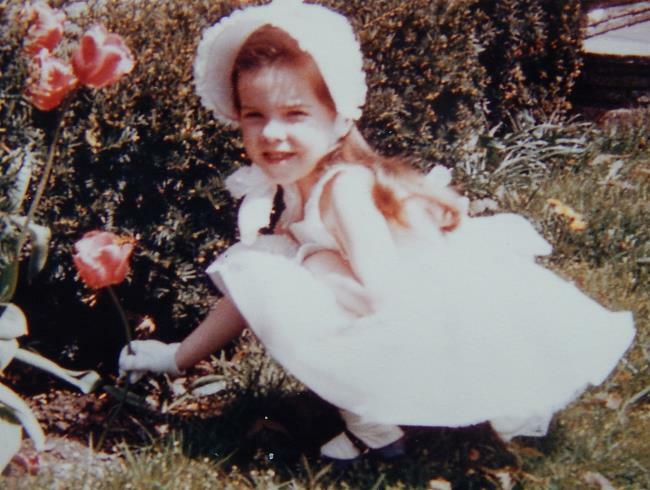 Some of my earliest memories are of puttering in the garden with my Nana (my gardening guru) when I was 2 or 3 years old. 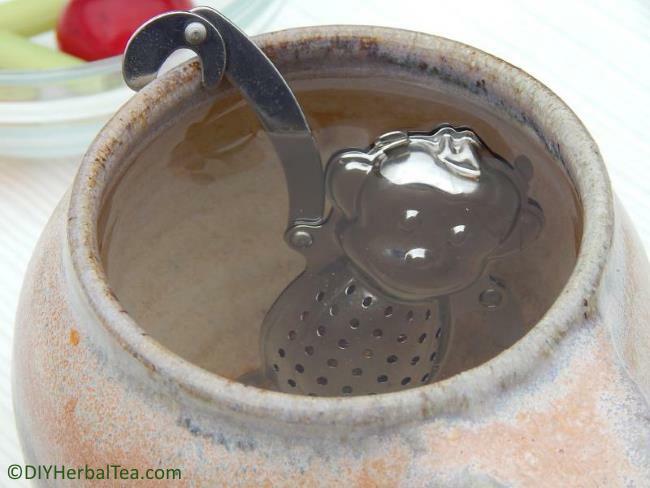 Look At That Cute Little Watering Can! With my own little trowel, garden rake, and watering can, I was happy as can be, side-by-side with Nana, "helping" her dig, plant and water her garden. I'd watch with fascination as her flowers grew and blossomed. And when it was time to pick some mint for her iced tea, she'd let me do it all by myself! At harvest time for strawberries and rhubarb, I was right there to help - and to taste the first bite of Nana's amazing homemade pies! 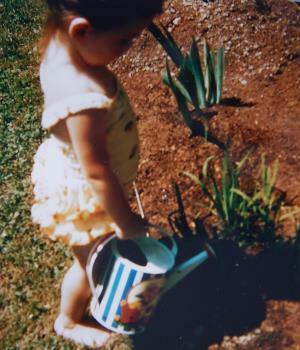 I was about 5 years old when my gardening talents (actually, my gardening luck ) first came to light in what I now fondly refer to as "The Geranium Incident". One spring weekend, Nana and Gramps took me along on their outing to our local garden center. There, on the ground in the parking lot, I found a wilted red geranium flower. I picked the flower up and carried with me around the store while Nana and Gramps shopped. At check-out time, Mr. Palazzi, the store owner, smiled at my find and told me to enjoy my flower. Enjoy it I did! Did I put the flower in a vase of water on my bedside table? Or course not. Even way back then, I rarely did anything the "normal" way. Looking back on it now, I can only imagine Nana's shock when, several weeks later, she discovered that my once-pitiful, half-dead little geranium flower had taken root and was growing new leaves! When I was 11 years old, growing pumpkins was my passion. My neighborhood friends and I had a fine time making homegrown Jack-o-Lanterns for Halloween! Now, as an adult, I'm still experimenting in my garden, always looking for something new and different to grow. Sometimes successfully, sometimes not so much. For me, it's always a great adventure! 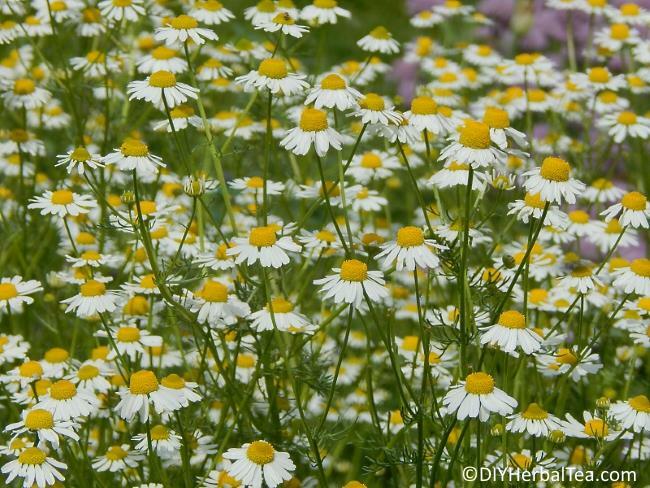 My fascination with growing herbal teas began innocently enough - with a free packet of german chamomile seeds that came with a new gardening magazine. One morning I looked at the seed packet sitting on my kitchen counter and thought, "Hmmmm, I should probably plant these." So I did. And they grew. Like crazy! My next thought was, "Hmmmm. 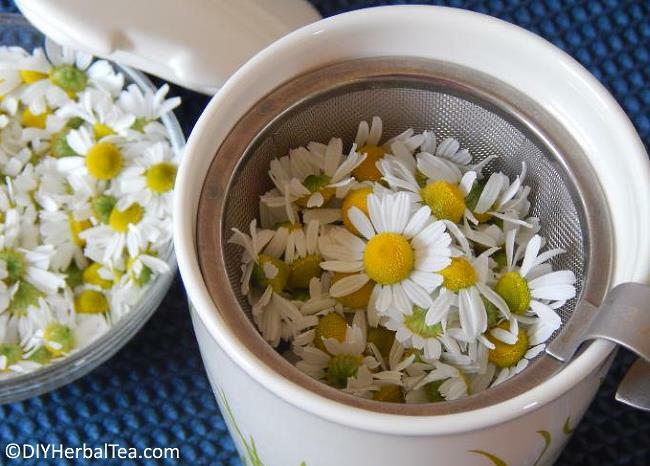 Maybe I should try making chamomile tea". So I did. And I liked it. Alot! 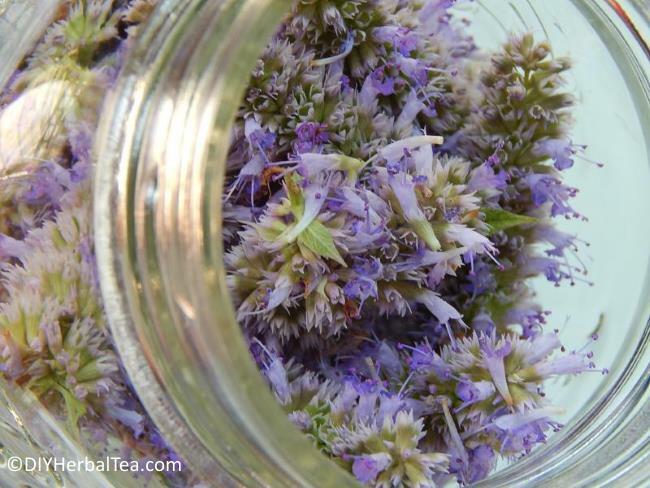 Since then, my herbal tea garden has expanded from one patch of chamomile in my flower garden to 10 different tea herbs - everything from my must-have chamomile, to a variety of mints, to unique tea herbs like bee balm and anise hyssop. 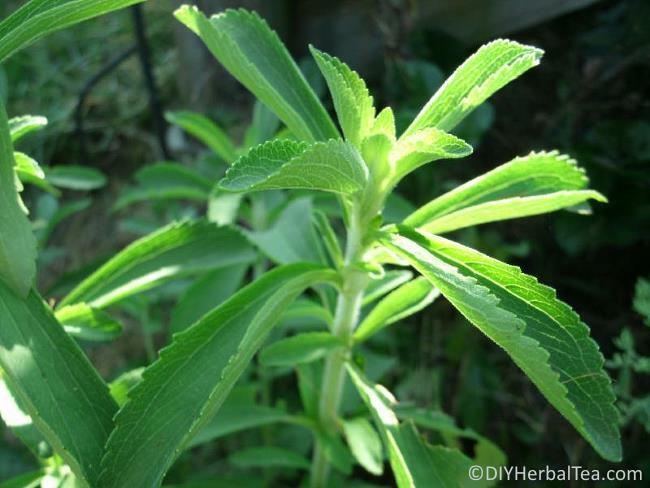 To sweeten my teas naturally, sans calories, I grow my own stevia, too. Homegrown Stevia Herb ~ Sweetness Beyond Compare! My herbs are like my little buddies. They're super-simple to grow, so they don't demand a lot of my time. And they reward me nicely! After a busy day, there's nothing quite like coming home to a refreshing glass of homegrown lemongrass iced tea, or having a cup of soothing chamomile tea before bed! During the highs and lows of day-to-day life, Nana was always there for me with a listening ear, wise advise ... and a lovely cup of tea. 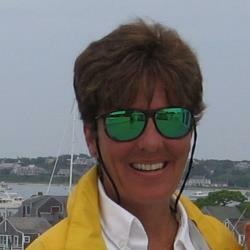 Sadly, Nana has passed away. But her love of gardening and her love of a tasty "cuppa" lives on in me. 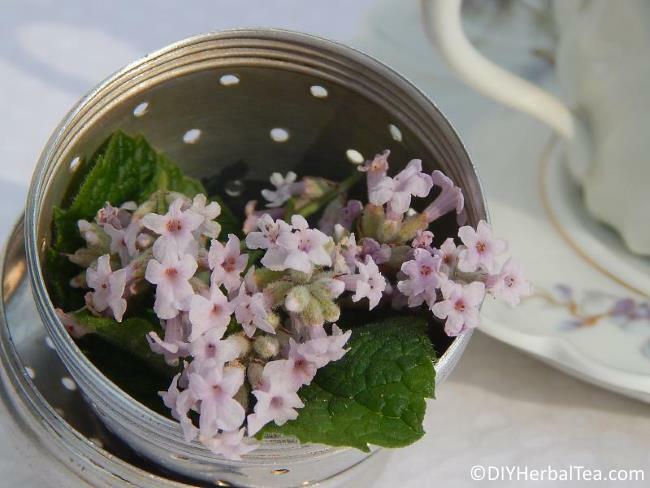 My DIY Herbal Tea website is a tribute to my Nana ~ and my way of sharing the delicious pleasures of herbal tea gardening with all of you. Grow ~ Brew ~ Enjoy!! This One's For You, Nana!